These double-wall glasses, as they are apparently called, are great for hot and cold drinks and also a nice way to serve desserts. I was sent a set of Curva Artisan Series double wall glasses by Ozeri (£24.96 on Amazon at the moment or 33 euros on the Spanish Amazon site) to review. So as well as using it for drinks, I created a yummy layered chocolate dessert recipe (see below). The glasses came in an attractive box that I thought would make a nice gift, and each glass was individually wrapped in bubble wrap to protect it. The double wall keeps cold drinks insulated and free of condensation, and also means hot drinks won’t feel as hot through the glass- I made a cup of tea and after I poured in boiling water the glass still felt cool! It did heat up after I left the drink a while of course but it makes quite an elegant way to serve a fruit tea or even a coffee I think. The glasses were surprisingly lightweight; they are made from borosilicate glass which is stronger and shatter resistant and not as heavy as glass. I really liked the way the liquid looked like it was suspended inside the glass; it creates a cool optical effect that I thought would work well for desserts. I was inspired by this recipe on Mel's Kitchen Café, for a peanut butter and chocolate layered dessert but as my boyfriend doesn't like peanut butter (I know, right?!) I decided to change the flavour for butterscotch. I bought some butterscotch flavouring on Amazon as I had a couple of recipes in mind I wanted to use it for. I also decided to add an Oreo cookie at the bottom of the dessert so my recipe was quite different in the end. First make the butterscotch or vanilla layer. Mix the sugar, cornflour and salt and mix in a little of the milk to make a paste. Stir in the rest of the milk and cream and bring to the boil whisking constantly. When the mixture has just boiled remove from the heat and add the butterscotch or vanilla flavour. Allow to cool a little. Place an Oreo cookie at the bottom of each serving glass and spoon over the butterscotch pudding. Place in the fridge to chill. Make the chocolate layer; mix the sugar, cornflour, cocoa powder with a little milk to make a paste. Add the rest of the milk and cream and bring to the boil whisking constantly. When the mixture has just boiled add the chocolate and stir until melted then remove from the heat. Allow to cool a little. Spoon on top of the butterscotch layer and chill in the fridge until completely cooled. To serve, spoon some whipped cream on top and add some butterscotch chips or chocolate shavings. I'm sending this to We Should Cocoa, hosted by Choclette at Tin and Thyme, as this month she is accepting any chocolate recipes. Those glasses look like a super idea Caroline and that pudding sounds super delicious. 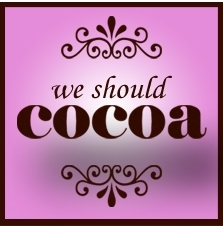 Thanks for sharing with #WeShouldCocoa.